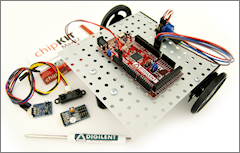 The Digilent Learn site is an open, freely accessible community resource for sharing teaching and learning materials focused on electrical and computer engineering. The site is built around a growing collection of hands-on design projects that offer insight and design experience in key areas like analog circuit design, microprocessor programming, and digital circuit design. All of the projects are posted under the Creative Commons license, so anyone can use, modify, and repost them as desired. Each project is self-contained and designed to expose a fundamental concept in hardware or software design. Projects are used by individuals pursuing their own goals, and by universities in formal educational programs. Individual projects can be selected by topic, area of interest, difficulty, etc. Modules are groupings of related projects that demonstrate a concept or lead you toward a new skill. Classroom contains material developed and currently in use across ECE courses. The hands-on design projects on this site are designed around various design kits, accessories and parts. All of these products, and much more, can be found on the Digilent website. Give us a visit! We'd like you to join with us as we continue to develop this resource, either by creating and contributing content, sharing course materials, or just keeping in touch as we continue to expand our offerings.